When it comes to kitchen appliances and utensils one of the most popular names is Cuisinart. It is known for its style, quality and reliability of its products. In the pressure cooker space too Cuisinart has a fantastic model the CPC-600 electric pressure cooker. While there are many regular pressure cookers in the market, the most convenient products are the electric cookers as they also have some intelligence embedded in them to help making cooking easier. With the CPC-600, Cuisinart has transformed a traditional cookware into something modern and interesting. They have added a lot of safety and convenience features into this cooker to ensure that it is easy to handle and cook. At the same time, it is highly efficient cooking food in less than 30% of the time traditional cooking techniques took. Cuisinart pressure cooker works pretty much the same way as regular pressure cookers. They enclose the cooker ingredients in an air tight compartment. As the temperature rises, water converts to steam and it gets trapped inside. As more steam get trapped, the pressure increases increasing the temperature. At these high temperatures, the food gets cooked. Even though nutrients are released, they have nowhere to go, as a result, they are retimed in the cooked food itself. Thus, pressure cooking is not only quick but also quite healthy. The Cuisinart pressure cookers have some very interesting features which make them such great products. These modern cookers come with pre-programmed buttons used for specific tasks. Rather than trying to figure out what is the best cooking technique, just press the button and let technology take over. The cooker comes with buttons for low pressure cooking, high pressure cooking, browning, simmering, Sauté and keeping warm. The cooker comes with 99 minute time with LED display. If you do not want to use the pre-set buttons and prefer to come up with your own recipe, you can use this timer for cooking. From 0 to 44 minutes you can increase the temperature in steps of one minute and from 45 to 99 minutes you can do that in increments of 5 minutes. Smart Cooking: Digital thermostat to control heat based on pressure and temperature. Besides the looks, the appliance itself has a lot of interesting and useful features too. One of the best aspects about CPC-600 electric pressure cooker is its smart cooking feature. You have many pre-sets for various cooking styles. 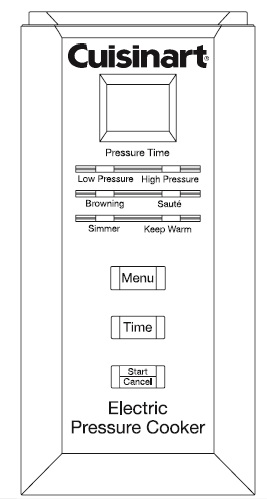 You can cook the grains at high pressure and use the low pressure setting for vegetables. Besides the 1000W power allows browning and sautéing of the foods too. For slow cooking you also have the simmer mode. Lastly, with the keep warm mode, you can ensure that the food stay warm till you are ready for the dinner. You can expand your culinary range to include roasts, stews, soups, and even desserts like custards and cheesecakes. The cooking times can be adjusted easily using the electric cooker settings too. The 99 minute LED display can be used for this purpose. Up to 40 minutes, you can increase the settings by one minute at a time. Beyond that you can go at 5 minutes at a time till you reach 99. Regardless of how long you cook, the stay cool side handles ensure that you can always handle the cooker easily without the fear of burning your fingers. The non-stick cooking pot means that you can cook some of the greasy or oily products and still not fear at the thought of cleaning the pot. You can clean the pot nice and shiny with simple dishwashing soap. In fact the pot is dishwasher safe so you can wash it regularly in the dishwasher too. The digital thermostat is another important feature in this cooker. This thermostat can intelligently regulate the heat transferred to the cooker to ensure that the temperature and pressure within the cooker does not go over limits. The final aspect about this cooker is that it comes with a three year limited warranty. So if you ever run into any problems due to manufacturing defects, you can get them fixed under the warranty. 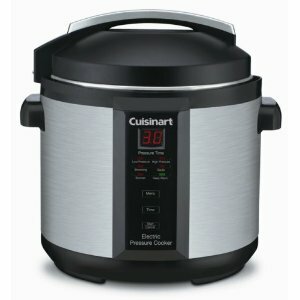 The Cuisinart CPC-600 is a classic pressure cooker model revisited and revamped to a modern cooking style, and redesigned to take its place in a contemporary kitchen. The classy stainless steel body with brushed steel finish is perfect for modern kitchens. Besides, the finish repels fingerprint stains, so you can handle it as you want without worrying about your fingerprints spoiling it. Cuisinart pressure cooker has a 6 quart capacity which is ideal for a small family or a single adult too. For a family of 3-4 people, the cooker is just large enough to cook food for the entire family, at the same time, even smaller quantities of food for single adult can be easily cooked in the same. The smaller capacity means that the size of the cooker is also small and hence it can be stored easily without occupying too much counter space. The handles of the cooker are specially designed to stay cool regardless of the temperature of the cooker itself. Hence it is easy to handle and move the cooker around without the fear of getting burnt. This intelligent cooker also comes with mechanism to maintain safe pressure within the cooker while cooking and releasing it if it goes beyond limit. Thus it is a very safe appliance to use. The cooker also has a lid that remains locked till the pressure is completely released. This is another safety net to ensure safe cooking. This cooker is also dishwasher safe, so you do not have to bother with having to clean it with your hand. The non-stick cooking pot is perfect for cooking all kinds of foods in the cooker without worrying about the grease or stain. Even on the external surface the unit is fingerprint proof made from brushed stainless steel housing. The best part about the package is that it comes with a full recipe cook book. So, even if you do not have a lot of menus based on pressure cooking, the book will help increase your repertoire of dishes. Since they are designed for cooking using the Cuisinart pressure cooker you get the perfect recipes for the perfect dish. Great support from Cuisinart company. So if you have problems with this pressure cooker, just called them and they will replace with a new one. Easy to use, you just set the temperature and time controls and let it do the work! Cooked very quickly, frozen fish done in 10 min. Sauce, soup, chilli and Risotto done in 20 minutes. Lousy manual because it missed some part of it. Poor quality because the bottom of the cooking pot started to peel off after used for several times. Cuisinart pressure cooker CPC-600 is the perfect choice for your pressure cooking needs. It is smart, classic and trendy. It is also very simple to use and with the pre-sets it becomes a very versatile cooking tool.